We’re celebrating Indiana-grown flowers this week! A huge thanks to my host Mark Zelonis, the Ruth Lilly Deputy Director of Environmental & Historic Preservation at the Indianapolis Museum of Art. He and his horticultural team made my visit a huge success last weekend! 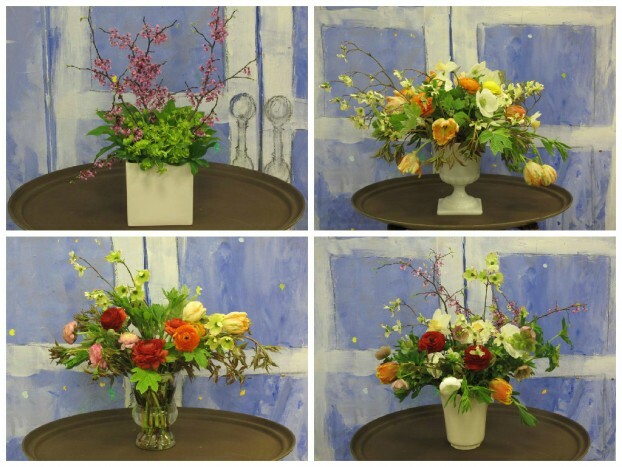 Admittedly, it was a challenge to source locally-grown flowers at the end of April in Indiana’s Zone 5, but with the help of some really supportive flower friends, we pulled it off! THANK YOU to the team at Welch Wholesale Florists (sisters Annie and Nora), who ordered our local tulips, ranunculus and anemones — straight from flower farmers nearby! 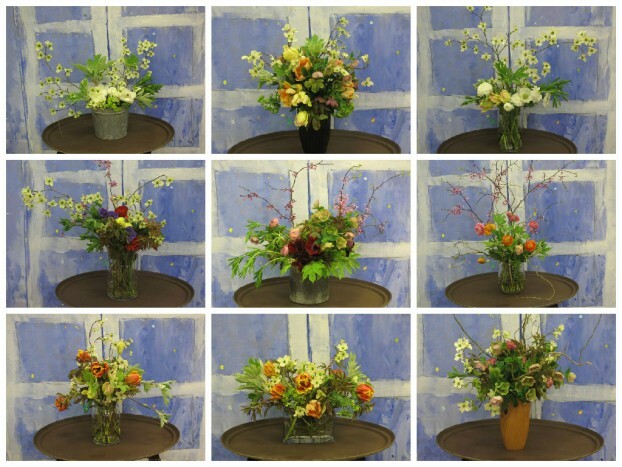 The designers in my afternoon workshop were so happy to create their arrangements using 100% local flowers and foliage. Enjoy their work here and admire the amazing diversity of styles and interpretation of the material. THANK YOU to the horticulture staff (Chad and Irvin) for giving me a golf cart and letting me drive around the “back lot” of the grounds to clip here and there. We gleaned baptisia foliage, oak leaf hydrangea foliage, young peony foliage, flowering dogwood, flowering redbud, hellebores galore, narcissus and euphorbia! 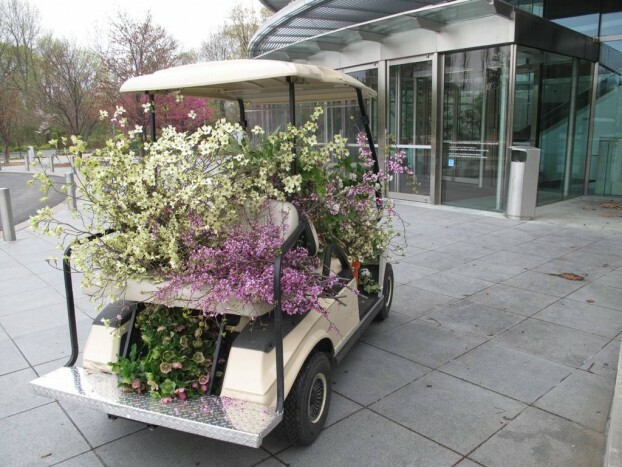 The horticulture staff’s awesome golf cart, filled with my early-morning cuttings! The Slow Flowers Challenge comes to Indiana with my own creation. 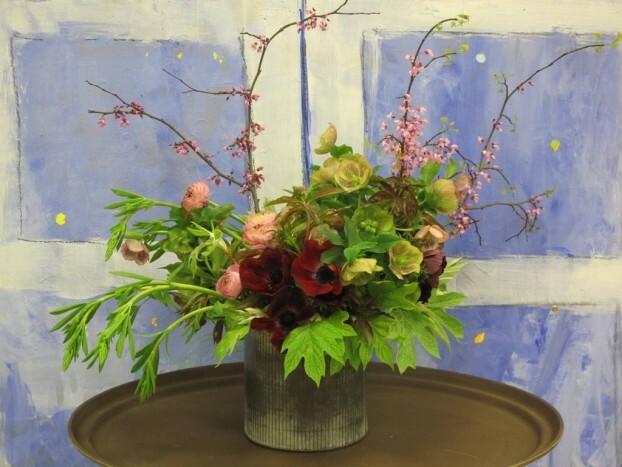 This entry was posted on Monday, May 4th, 2015 at 3:46 pm	and is filed under American Grown, Blog Posts, Creativity, floral design, General, Slow Flowers Challenge. You can follow any responses to this entry through the RSS 2.0 feed. You can leave a response, or trackback from your own site. It was a great class and loads of fun. Thank you for bringing Slow Flowers to Indianapolis!